Written in 1941, Arsenic and Old Lace is not only a classic comedy - it is a superb black comedy. This type of humour relies on the presentation of distasteful ideas, such as death by poisoning, in such a way that the audience forgets to be appalled. The writing here is pure magic. The innocence of Abby and Martha is the key to its success. They have a very different view of life where charity certainly begins at home, but not in the conventional sense. Watching their nephew Mortimer struggle with his aunts' version of reality is, if you'll pardon the pun, killingly funny. His brother, Jonathan - of dubious mental state with a string of random murders to his name - and his sidekick, the dipsomaniac Dr Einstein, are treated as little more than a pair of wayward schoolboys. Add to the mix brother Teddy, who thinks he's President Roosevelt, a bemused fiancee and her father, four police officers (three of whom are not really that bright), a potential lodger and the superintendent of a sanatorium, and this great comedy is the result. This play has stood the test of time, and is as funny now as when it was written. 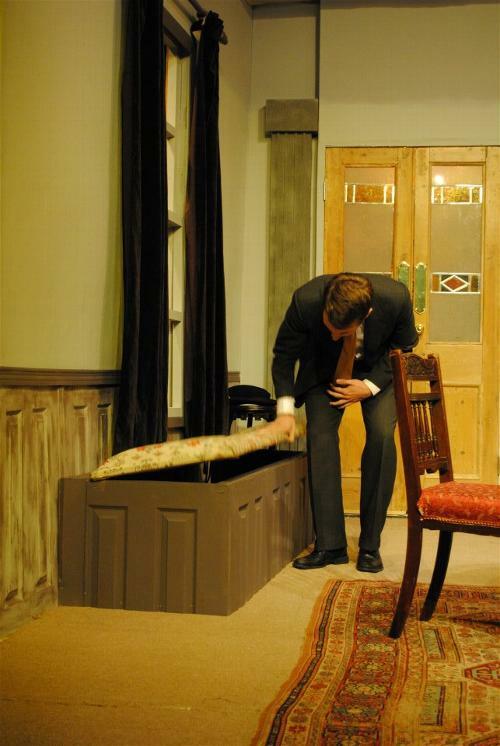 I have long loved this play, and have had a great time directing it. Martha: "If I know what pure goodness and charity is..."
Officer Klein: "Not much to report, Mr President"
Mortimer: "I'm nuts about you!" "There's a body in the window seat!" Martha: "It's only our little amusement..."
Einstein and Jonathan enter uninvited, Martha and Abby hide! Einstein: "I saw that movie too!" Officer O'Hara: "My mother was Peaches Latour!" O'Hara: "They practically stole that from my play!" There can not have been many in the audience who did not have at least a vague recollection of seeing this 1939 Joseph Kesselring play before, perhaps in the black and white film version with Cary Grant. 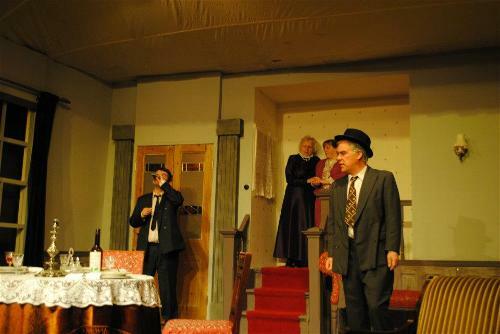 The Adel Players version was fast paced, superbly acted with American accents, the room setting – a front room of an old Brooklyn, New York house - was wonderful, and the music well-chosen. The Director, Dianne Newby, had done another superb job. She was not alone – Chris Andrews as the main male character, was charismatic and confident – not a million miles from Cary Grant in fact – high praise! His fiancée, Rachel Newby was lovely – and is a relative newcomer on the Adel stage. In fact the Newby family was much in evidence with David appearing in the final (or his final?) scene and Matthew making his debut as a police officer. Ben Robinson was another making a debut, also as a police officer. It was a large cast and some of the Players stalwarts, Stella Garside and Pat Riley, both brilliant as the sisters, Robert Colbeck as the wonderfully mad brother Teddy, David Pritchard as the menacing criminally insane brother, and Gavin Jones as the alcoholic mad surgeon, took the major parts. 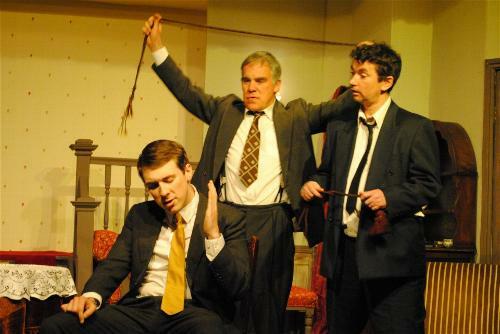 Alan Foale, Bernard Riley, Jon Holmes and David Lancaster took the remaining parts – all giving excellent performances. This company really does not have weak links. I was amazed by how clever and how funny the play was... the main humour was in the situation, but there were some lovely (and quite modern) lines too. Remembering the two sisters hid a dark secret (but not too sure of the details), I found the tension building up quickly as they dispensed soup around the neighbourhood. The lack of scene changes meant that the action proceeds uninterrupted – so the interval arrived with me on the edge of the seat, totally unaware of time passing. In the final scene, the tension builds up again – being diffused with a lovely "feel good" ending. I was surprised to find that Boris Karloff actually appeared in the original production – attracted by his name appearing in the script. Always nice to leave a theatre feeling that one had really been entertained! If you have not seen this play for some time, I’d really recommend it as an excellent evening out. A shame if you missed this Adel Players production. on Arsenic & Old Lace, which we thoroughly enjoyed on Saturday (as I'm sure everyone did judging by the reception at the end). It's a great play and was very well performed and produced on an excellent set. Have you recently seen an Adel Players' performance? Let us know what you thought about the production and the facilities provided by emailing us (see Contact Us) or using the feedback facility on our Comments page. and maybe see your own comments featured on this page. We would love to hear from you.